Why Are Teens at a Higher Risk of Gum Disease? Teenagers are at a higher risk for gum disease because of the hormonal changes they experience as they develop into adults. However, there are many effective ways to reduce this risk for your teenager. There are a few different forms of gum (periodontal) disease, but essentially, it is an inflammation of the gums that is caused by an excess of plaque and tartar on the teeth. Gingivitis is the mildest form of gum disease, and it’s the most common in teens. When gingivitis is present, it causes the gums to turn red, swollen and inflamed, and to bleed easily. When gingivitis is left untreated, it progresses to full blown periodontal (gum) disease. In periodontitis, the gums pull away from the teeth and form pockets, which become infected. Eventually, as the body tries to fight the infection by breaking down the connective tissue surrounding the it, the teeth can start to become loose or even fall out. Why are teenagers at a higher risk For gum disease? The hormonal changes that take place during puberty can put some teenagers at a greater risk for periodontal (gum) disease. Increased levels of hormones cause increased blood circulation, and this happens in the gums as well. This, in turn, can increase the sensitivity of teenagers' gums to irritation, plaque, or food particles, causing them to turn red and feel tender. 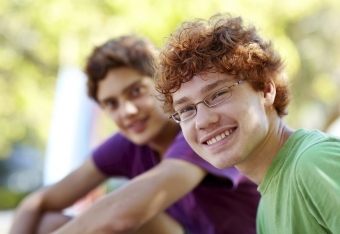 How can I help keep my teen’s smile healthy? A well-established, thorough and regular oral hygiene routine is a teen’s best bet for avoiding gum disease. That includes regular brushing and flossing, and regular dental care. If your teen’s oral health routine leaves something to be desired, work together to get it back on track. Make an appointment with your Smile Town North Delta team. Our dentists and hygienists can provide all sorts of tips, advice, information and demonstrations that will help your teen care for his or her teeth and gums. Then, make sure your teen stays on top of his or her oral care at home. Remind your teen regularly to brush and floss, and provide a variety of toothbrushes, flosses, toothpaste, mouthwash, and dental picks (Teens may put on a tough act, but they aren’t immune to the novelty of uniquely flavoured and coloured flosses and toothpastes!). Make these dental health care products readily available anywhere in your home where there’s a sink. In other words, make taking care of his or her teeth as convenient for your teen as possible. Emphasizing good oral health to your teen is important, but they’ll notice if you don’t practice what you preach! Show your teen that you mean business, and give your own oral care routine a boost. This will do you good, too.